One thing Mattel seems to do right regarding the DC Comics license, if you ask me, is the Imaginext line (sold under the Fisher Price brand). Their sets are usually available all year round at retail, and even though they don’t churn out wave after wave of figures, their character roster has grown steadily over the last few years. Female characters have been conspicuously absent from the Imaginext line in general, but that also seems to be changing. Case in point, the other day at the store I found a 2-pack set of figures that includes Superman and Wonder Woman. Female Imaginext characters are not that different from the male ones, construction-wise, but they do require a completely new buck to be built upon, which is good to see from a line that relies so heavily in repaints to produce different characters. 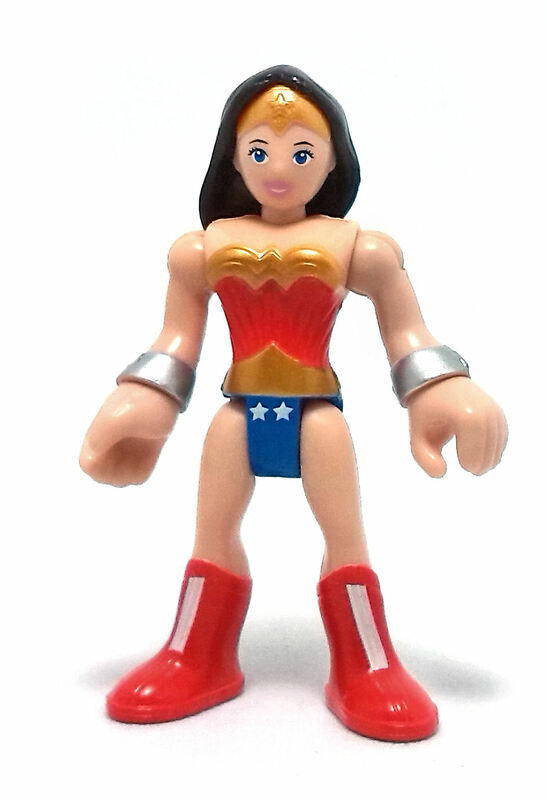 Wonder Woman’s physique is very stylized, and her torso displays character-specific elements sculpted to represent her costume. The head sculpt is equally stylized and keeps with the simple design aesthetic of this line. Superman is also a newly sculpted body, meant to approximate the more modern costume seen in the latest Man of Steel movie. 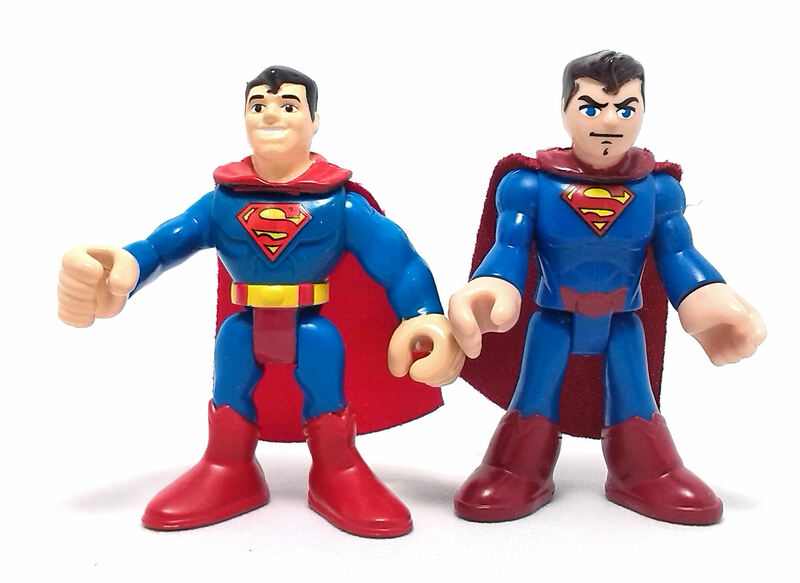 Next to the previous Imaginext Superman version, the differences are clear. 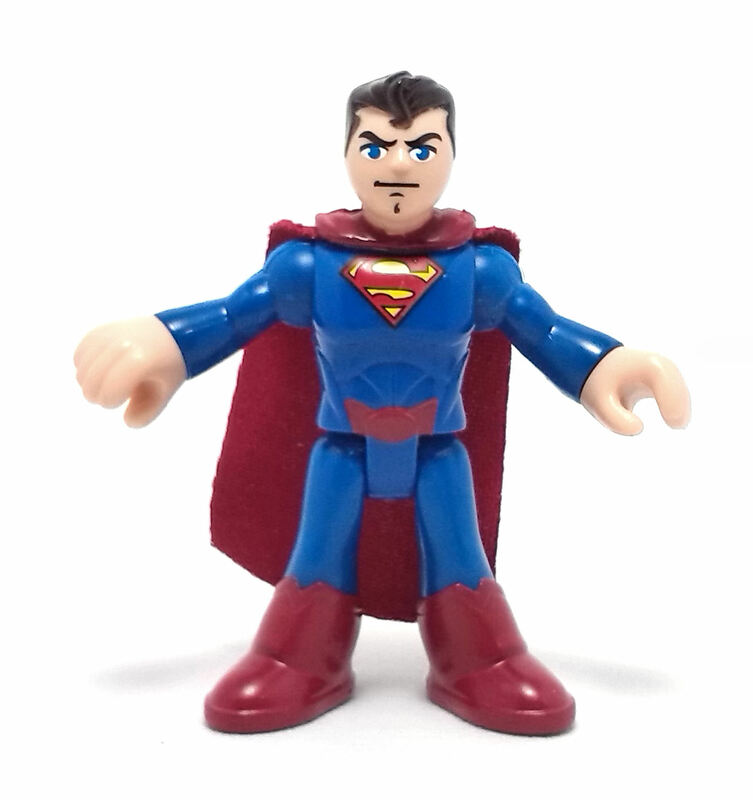 I kind of like the more generic face on the new Superman, as I have felt that the older head sculpt looked a bit out of place next to the regular Imaginext people. Both figures have almost the same amount and type of articulation consisting of injection molded shoulders and simple swivel wrists and hips. As usual for this type of figures, both legs are connected to the same axis of rotation, so they move in unison. 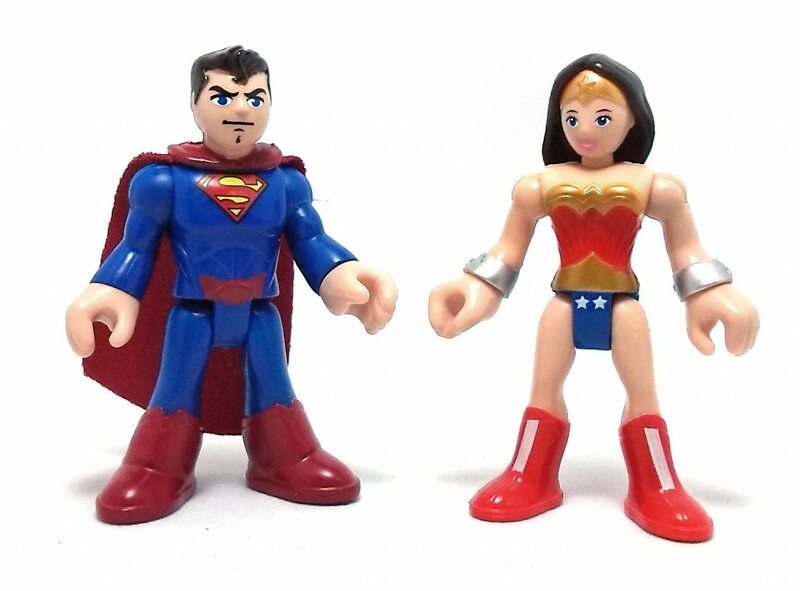 Neither Superman nor Wonder Woman have much in terms of neck articulation, though. 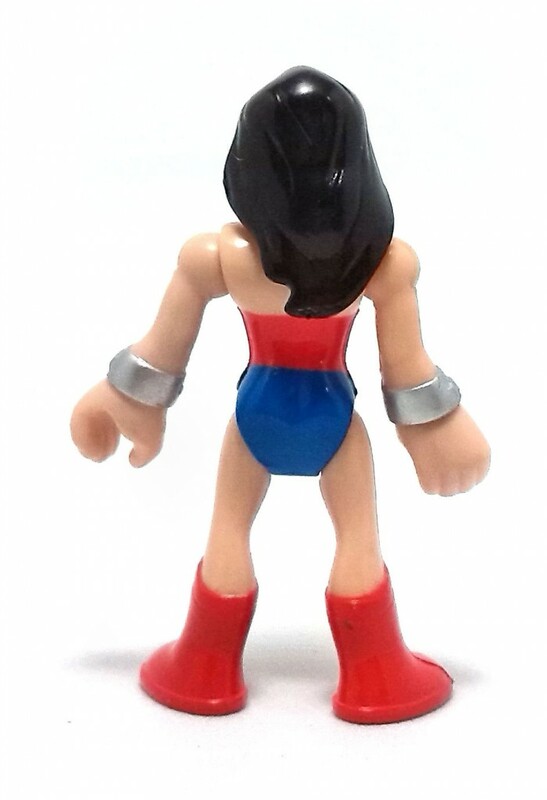 Superman’s neck is designed to keep the cloth cape in place, while the hair on Wonder Woman prevents her from turning her head in any significant way. The paintjob on both figures is good and kept o a minimum. Both have nicely painted facial features and Superman’s shield looks crisp and clean. 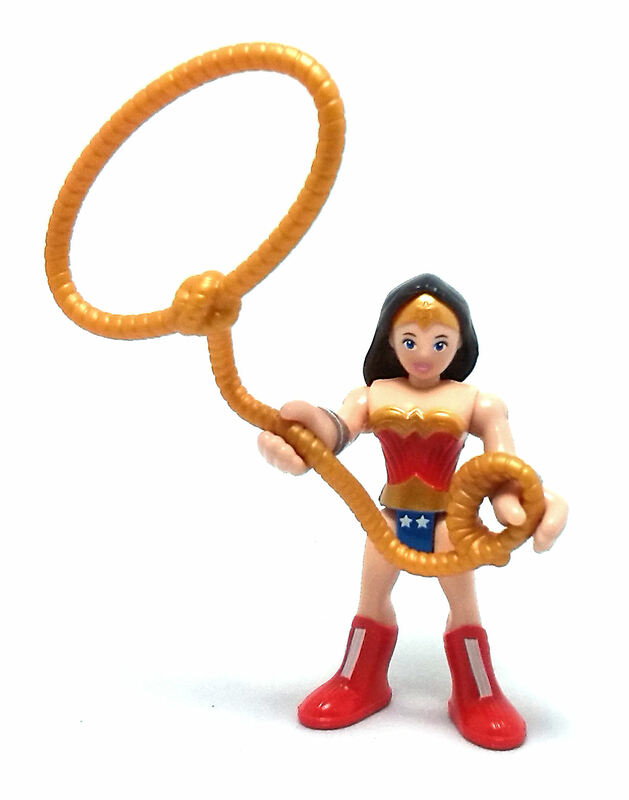 There are no accessories whatsoever for Superman in this set, but Wonder Woman does have her magic lasso, molded in bright gold plastic. Overall, I think this is these are a couple of neat little action figures to have. Why do they make the superman’s look mean and mad? That’s not who superman is.